""DC and Marvel artist Koblish (Deadpool) draws himself dying in ways imaginative, mundane, and frequently impossible. In one comic after another, most only a page long, his smiling, hapless cartoon doppelgänger is devoured by baboons, beaten by a boxing kangaroo, carried into space by balloons, killed by his own hair, and, as many cartoonists have no doubt imagined themselves perishing, left to die of old age at a fan convention while waiting for someone to buy one of his comics . His action-comics style is simplified but lifelike, and the unfortunate Cartoon Scott is cute as he naively wanders into one dangerous situation after another like a video game avatar." "Turns out one of Deadpool's comic artists has been drawing his own death for years. . . . In a lot of ways the book seems to share the same goofy humor that makes Deadpool such a lovable character." "This whimsical collection of 4-panel comics will sate everyone's need for schadenfreude." 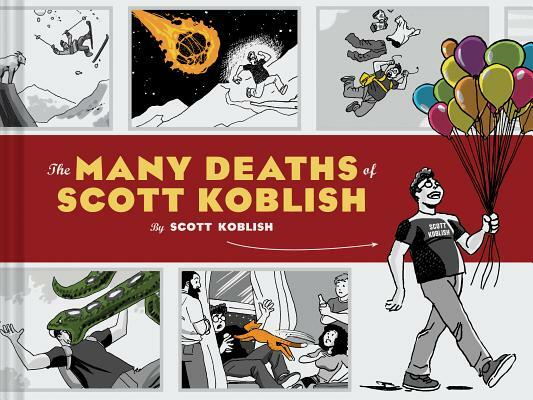 "Scott Koblish is a cartoonist who, for some reason, likes to draw himself dying, over and over again. He falls off crumbling cliffs, gets abducted by aliens (and then shot down by the army), has skiing accidents, and is attacked by evil poodles. Oh, and there's a darn cat that just keeps jumping up and knocking him over railings in various locations. . . . they're pretty hilarious. If you liked that montage in Groundhog Day where Bill Murray tries to off himself to escape the time loop, this has a similar feel but with many, many more scenes." "Death by steamroller. Death by healthy cereal. Death by falling manatee. Cartoonist Scott Koblish has compiled the cheeriest memento mori you're likely to come across - a series of wordless, mostly one-page comic strips in which Koblish's bespectacled cartoon avatar dies. And dies. And dies and dies and dies . . . It should be depressing, this parade of merciless mortality, but Koblish's style is so charming, his command of body language and facial expression so sure, and his imagination so twisted (watch out for that orange tabby, Scott!) that this funny, breezy collection ends up being one of the year's most bizarrely life-affirming reads."